Image courtesy of One of the customers leaving money for sunglasses and batteries at the unmanned cash register. 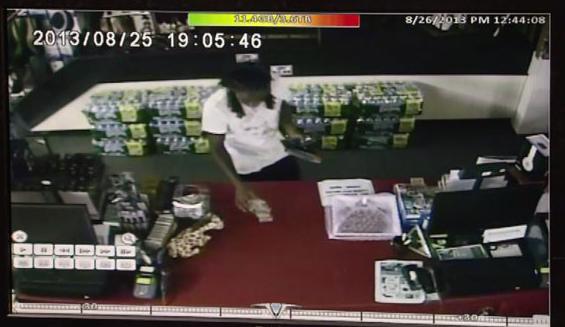 One of the customers leaving money for sunglasses and batteries at the unmanned cash register. Back in college, I remember coming across an accidentally unlocked snack machine early one morning. It would have been so easy to just steal all the knock-off Doritos and not-quite-Oreos we wanted, but my university has a very strict honor code and we could have been kicked out of school for pilfering the bargain foodstuffs. And so we reluctantly chose to close the machine and secure the lock. On Sunday night, a group of young men in New Jersey faced a similar quandary, except they could have boosted everything from a store that had accidentally been left unlocked. A recently opened store in Wayne, NJ, should have been closed shortly after 7 p.m. on Sunday, but the store’s locking system apparently malfunctioned, leaving the store unlocked and the lights on. To any passerby, it would seem like the store was still open for business. And so it was that a few men innocently entered the store to do some shopping, only to find that no one was around to actually ring up their purchases. You can see them on the video below calling out for assistance, but obviously no one heeded that call because no one was working. Rather than give into the temptation to steal things, the men instead chose to leave money on the counter. You can even see them in the video, speaking to the security camera behind the counter, indicating that they are paying for their purchases. The store’s owners only found out about this after receiving a call from the police that there had been a break-in at the store. When they arrived to check on the damage, they didn’t notice that anything had been disrupted so they checked the security camera footage. That’ when they saw the goodhearted customers. Next If Hospital Names Its ER After Abercrombie & Fitch, Will Patient Gowns Come In XL Sizes? Next Up: If Hospital Names Its ER After Abercrombie & Fitch, Will Patient Gowns Come In XL Sizes?